Low-grade inflammation has been implicated in the development of Type 2 diabetes and cardiovascular disease, but its role in the pathogenesis of the metabolic syndrome is unclear. We investigated the association between C-reactive protein (CRP) levels and the development of the metabolic syndrome and diabetes in men. Serum CRP concentrations and factors related to insulin resistance were determined in middle-aged Finnish men who participated in a population-based cohort study and were free of diabetes at baseline. At the 11-year follow-up, 143 of 680 men had developed the metabolic syndrome as defined by the National Cholesterol Education Program (NCEP) and 103 of 598 men had developed the metabolic syndrome as defined by the World Health Organization (WHO). Our analyses excluded men with the metabolic syndrome by the respective definition at baseline. In all, 78 of 762 men developed diabetes over the same period. Men with CRP concentrations ≥3 mg/l had a several-fold higher age-adjusted risk of developing the metabolic syndrome (NCEP definition: odds ratio [OR]=3.2, 95% CI 1.9–5.5; WHO definition: OR=3.4, 95% CI 2.0–6.1) or diabetes (OR=4.1, 95% CI 2.1–8.0) than men whose CRP levels were <1.0 mg/l. Even after further adjustment for potentially confounding lifestyle factors and factors related to insulin resistance, the risk of diabetes (OR=2.3, 95% CI 1.0–5.1) was still increased in men with CRP concentrations ≥3 mg/l, but the association with the metabolic syndrome was no longer significant. Low-grade inflammation may increase the risk of the metabolic syndrome and diabetes in middle-aged men, but some of the risk is mediated through obesity and factors related to insulin resistance. Low-grade inflammation may be part of the “common soil” underlying the metabolic syndrome, Type 2 diabetes and cardiovascular disease. Low-grade chronic inflammation is associated with cardiovascular disease [1, 2, 3, 4, 5, 6], diabetes, insulin resistance, features of the metabolic syndrome [1, 2, 3, 4, 5] and the metabolic syndrome itself . IL-6 is a pro-inflammatory cytokine produced by adipose tissue, endothelial cells, macrophages and lymphocytes. C-reactive protein (CRP), an acute-phase reactant, is synthesised in the liver largely in response to IL-6. Recent studies indicate that inflammation, as measured by IL-6 and CRP, predicts not only cardiovascular events [8, 9], but also the development of diabetes [10, 11, 12, 13, 14]. Low-grade inflammation may promote atherosclerosis and insulin resistance and predispose to the development of the metabolic syndrome and diabetes by several mechanisms [1, 2, 3, 4, 5, 6]. IL-6 may interfere with insulin signalling through the induction of proteins that bind to the insulin receptor , and it appears to down-regulate corticosteroid-binding globulin, which may lead to increased free cortisol concentrations, insulin resistance and other manifestations of the metabolic syndrome . IL-6 also inhibits lipoprotein lipase activity and increases concentrations of NEFA, contributing to dyslipidaemia and insulin resistance . In addition, IL-6 stimulates the secretion of major pro-inflammatory cytokines such as IL-1. In turn, IL-1 and TNF-α, which are also secreted from adipose tissue, induce IL-6 secretion. TNF-α decreases insulin-mediated glucose uptake and impairs endothelial function . Pro-inflammatory cytokines, and possibly CRP itself, may also directly promote atherosclerosis and thrombosis by the induction of nuclear factor-κB and the release of adhesion molecules and plasminogen activator inhibitor-1 [3, 4, 5]. Recently, CRP [10, 11, 12, 13, 14, 18] and pro-inflammatory cytokines [10, 19] have been shown to predict Type 2 diabetes in diverse populations with varying risk factors. These associations are markedly reduced after adjustment for BMI or other factors related to insulin resistance, but an independent predictive value was retained in some studies [10, 12, 20]. The metabolic syndrome as defined by the National Cholesterol Education Program (NCEP)  and World Health Organization (WHO)  increases the risk of diabetes by 5 to 9-fold  and cardiovascular mortality by 2 to 3-fold . Only one study has reported that CRP concentrations predict the development of the metabolic syndrome . In this study by Han et al. the association was present in Mexican women, but not in men. Furthermore, the definition of the metabolic syndrome was devised by the authors themselves and differed substantially from definitions provided by the NCEP and the WHO. 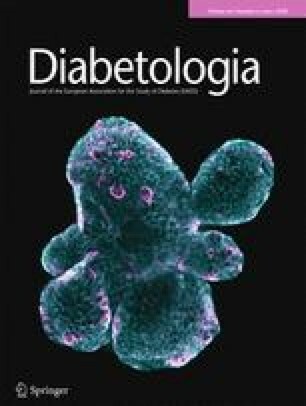 To further define the role of chronic low-grade inflammation in the pathogenesis of the metabolic syndrome and diabetes, we investigated whether CRP concentrations at baseline were associated with the development of the metabolic syndrome and diabetes over an 11-year follow-up in a population-based cohort of non-diabetic, middle-aged men. The subjects were participants of the Kuopio Ischaemic Heart Disease Risk Factor Study (KIHD) . This is an ongoing prospective, population-based study that was designed to investigate risk factors for chronic diseases, including Type 2 diabetes and cardiovascular diseases, among middle-aged men. The study population was a random, age-stratified sample of men living in Eastern Finland who were aged 42, 48, 54 or 60 years at baseline examinations. Of the 3235 eligible men, 2682 (82.9%) participated in the study. The recruitment of the subjects has already been described in detail . The University of Kuopio Research Ethics Committee approved the study. All participants gave their written informed consent. Of the original cohort, 854 men who had undergone carotid ultrasound at baseline (between the years 1987 and 1989) participated in the follow-up examination 11 years later. Of these men, 762 without diabetes and with CRP levels lower than 10 mg/l at baseline were included for analyses with diabetes as an endpoint. For analyses with the metabolic syndrome according to the NCEP or the WHO as an endpoint, 680 and 598 men were without diabetes and the metabolic syndrome by the respective definition, and had CRP levels lower than 10 mg/l at baseline. BMI was calculated as weight (kg)/(height [m])2. Waist girth was recorded as the average of two measurements taken after inspiration and expiration at the midpoint between the lowest rib and the iliac crest. WHR was defined as the ratio of the waist girth : hip circumference measured at the trochanter major. Blood pressure was measured with a random-zero mercury sphygmomanometer (Hawksley, Lancing, UK). The measurement protocol included three measurements in the supine position, one in the standing position and two in the sitting position with 5-min intervals between measurements. The mean of all six measurements was used to calculate systolic and diastolic blood pressure. Subjects were asked to fast for 12 h before blood sampling, which was performed between 08.00 and 10.00 hours. They were also asked to refrain from smoking for 12 h and from consuming alcohol for 3 days before blood draws. Blood glucose was measured using a glucose dehydrogenase method after precipitation of proteins in trichloroacetic acid. The serum samples for insulin determination were stored frozen at −80 °C. Serum insulin was determined with a Novo Biolabs RIA kit (Novo Nordisk, Bagsvaerd, Denmark). HDL fractions were separated from fresh serum by combined ultracentrifugation and precipitation. The cholesterol contents of lipoprotein fractions and serum triglycerides were measured enzymatically. Serum CRP was measured with an immunometric assay (Immulite High Sensitivity CRP Assay, DPC, Los Angeles, Calif., USA). We used CRP cut-off values of 1.0 mg/l and 3.0 mg/l, as recommended by the Centers for Disease Control and the American Heart Association . To limit confounding of the results due to acute infection or diseases associated with hypersedimentation, we excluded men with CRP concentrations higher than or equal to 10.0 mg/l. The metabolic syndrome was defined according to recommendations by the NCEP and the WHO. The NCEP defines it as the presence of three or more of the following: (i) fasting blood glucose levels ≥5.6 mmol/l (equivalent to plasma glucose levels ≥6.1 mmol/l ); (ii) serum triglycerides ≥1.7 mmol/l; (iii) serum HDL <1.0 mmol/l; (iv) blood pressure ≥130/85 mm Hg or use of blood pressure medication; or (v) waist girth >102 cm . The WHO definition of the metabolic syndrome was modified as described previously [23, 24] and defined as the presence of hyperinsulinaemia (fasting serum insulin concentration in the top 25% of values for non-diabetic men), impaired fasting glucose or diabetes, and the presence of at least two of the following: (i) abdominal obesity (WHR >0.90 or BMI ≥30 kg/m2); (ii) dyslipidaemia (serum triglycerides ≥1.7 mmol/l or serum HDL cholesterol <0.9 mmol/l); or (iii) hypertension (blood pressure ≥140/90 mm Hg or use of blood pressure medication) . Impaired fasting glucose was defined as a fasting blood glucose concentration of 5.6 to 6.0 mmol/l, equivalent to a plasma glucose concentration of 6.1 to 6.9 mmol/l . Diabetes was defined as a fasting blood glucose concentration greater than or equal to 6.1 mmol/l (equivalent to plasma glucose ≥7.0 mmol/l) or a clinical diagnosis of diabetes with either dietary, oral or insulin treatment . Men with diabetes at baseline were excluded from this study. Assessments of medical history and medications, smoking, alcohol intake, socioeconomic status and moderate-to-vigorous physical activity have been described previously [28, 29, 30]. The trend across the CRP cut-off values of 1.0 mg/l and 3.0 mg/l was estimated by entering the categorical CRP variable as a continuous variable into regression analyses with baseline clinical and biochemical variables as the outcome. To assess the association of CRP with diabetes and the metabolic syndrome, CRP categorised according to the 1.0 and 3.0 mg/l cut-off values was entered into logistic regression models for analyses with the metabolic syndrome and diabetes. To assess the association of CRP categories with a four-variable metabolic outcome (none of the metabolic endpoints [diabetes, the metabolic syndrome by the WHO definition, or the metabolic syndrome by the NCEP definition], one of the three endpoints, two of the endpoints, or all three of the endpoints), polynomial logistic regression was used. The covariates for the regression models were forced into the model. In binomial and polynomial logistic regression models including the metabolic syndrome as an endpoint, men with diabetes and the metabolic syndrome by the respective definition at baseline were excluded. Variables are given as means ± SD, except for variables with a skewed distribution, which are given as medians and interquartile ranges, and proportions, which are given as percentages. In analyses using continuous variables, skewed variables were log transformed. All statistical analyses were performed using SPSS 11.0 for Windows (Chicago, Ill., USA). A p value of less than 0.05 was considered to be statistically significant. The baseline clinical characteristics of the men are presented in Table 1. Most features that are part of, or related to, the metabolic syndrome changed in a graded fashion across CRP categories. Smoking was much more common in men with CRP levels ≥3.0 mg/l (high-CRP group) than in men with CRP levels <1.0 mg/l (low-CRP group). Mean blood pressure was higher and use of anti-hypertensive medication more common in the high-CRP group; LDL cholesterol was also higher. Men in this group were, on average, heavier and had a larger waist girth and WHR than men in the low-CRP group. They were also more dyslipidaemic and had higher insulin and glucose concentrations. Consistent with these findings, the metabolic syndrome as defined by the NCEP and WHO was also more prevalent in men with elevated CRP concentrations. At the 11-year follow-up, 143 of 680 men had developed the metabolic syndrome as defined by the NCEP and 103 of 598 had developed the metabolic syndrome as defined by the WHO. These figures exclude men who had the metabolic syndrome according to the respective definitions at baseline. The high-CRP group was 3.2 to 3.4 times more likely to develop the metabolic syndrome than the low-CRP group in models adjusting for age (Model 1, Table 2). This association was diminished when further adjustments were made for lifestyle risk factors (Model 2) and BMI (Model 3), particularly for the NCEP definition. Nevertheless, even when these factors were controlled for, men in the high-CRP group at baseline had a 2.4-fold higher risk of the metabolic syndrome as defined by the WHO definition than men in the low-CRP group. Additional adjustment for factors related to insulin resistance (Model 4) further weakened the association. In Model 4, significant baseline predictors of the metabolic syndrome (NCEP definition) included cardiovascular disease (odds ratio [OR]=1.67, p=0.037), smoking (≥20 cigarettes/day vs none, OR=2.23, p=0.007), systolic blood pressure (OR=1.26 for a 1-SD increase, p=0.030), waist girth (OR=2.24 for a 1-SD increase, p<0.001) and the log of triglyceride concentrations (OR=3.06 for a 1-SD increase, p<0.001). Baseline blood pressure medication and blood glucose concentrations had a borderline association with the development of the metabolic syndrome as defined by the NCEP (p=0.055–0.059). Significant baseline predictors of the metabolic syndrome (WHO definition) included cardiovascular disease (OR=1.71, p=0.040), alcohol intake (>84 g/week vs abstinence, OR=2.59, p=0.032), systolic blood pressure (OR=1.40 for a 1-SD increase, p=0.003), blood pressure medication (OR=2.40, p=0.005), WHR (OR=1.67 for a 1-SD increase, p<0.001), the log of insulin concentrations (OR=2.29 for a 1-SD increase, p=0.035) and the log of triglyceride concentrations (OR=1.91 for a 1-SD increase, p=0.012). Exclusion of smokers from these analyses either had no effect or strengthened these associations. There was no evidence of an interaction between BMI and CRP, and the associations between CRP and the metabolic syndrome were similar in men with BMIs lower than 27 kg/m2 and in those with values higher than or equal to 27 kg/m2. During the 11-year follow-up, 78 of the 762 men developed diabetes. Subjects in the high-CRP group were 3.6 to 4.1 times more likely to develop diabetes than those in the low-CRP group in models adjusting for age (Model 1, Table 3) and further for lifestyle factors (Model 2). Additional adjustment for BMI (Model 3) weakened the association. Even after adjustment for factors related to insulin resistance (Model 4), the high-CRP group were still 2.3 times more likely to develop diabetes than the low-CRP group. Significant baseline predictors of diabetes in Model 4 included WHR (OR=1.40 for a 1-SD change, p=0.025), the log of insulin concentrations (OR=2.04 for a 1-SD increase, p=0.025) and blood glucose concentrations (OR=2.74 for a 1-SD increase, p<0.001). Exclusion of smokers from these analyses did not qualitatively alter these findings. There was no evidence of an interaction between BMI and CRP, and the association between CRP and diabetes was similar in men with BMIs lower than 27 kg/m2 and in those with values higher than or equal to 27 kg/m2. The majority of the men who remained free of the metabolic syndrome and diabetes had CRP levels lower than 1 mg/l at baseline, and only about 10% had CRP concentrations between 3.0 and 9.9 mg/l (Fig. 1). Conversely, only 25% of those who developed diabetes and the metabolic syndrome by both the NCEP and WHO definitions were in the low-CRP group, whereas approximately 40% were in the high-CRP group. The CRP levels of men with one or two of the metabolic endpoints had a distribution between these two extremes. This population-based, prospective cohort study provides evidence supporting low-grade inflammation as part of the “common soil” leading to development of the metabolic syndrome, diabetes and cardiovascular disease. CRP concentrations at the high end of the normal range not only predicted increased risk of diabetes, but also the metabolic syndrome during the 11-year follow-up. To our knowledge, this is the first study to report an association between CRP and the development of the metabolic syndrome using an accepted definition. Non-diabetic men with CRP levels greater than or equal to 3 mg/l at baseline were 3.2 to 3.4 times more likely to develop the metabolic syndrome as defined by the NCEP and the WHO. This increased risk was not explained by lifestyle factors, but adjustment for BMI attenuated the association, particularly for the NCEP definition. It is to be expected that obesity weakens the association, since adipose tissue is a major source of pro-inflammatory cytokines such as IL-6 and TNF-α. Attenuation of the association after adjustment for factors related to insulin resistance also suggests that inflammation is an integral part of the disturbances in insulin, glucose and lipid metabolism that underlie the metabolic syndrome. Inflammation may also mediate the development of the metabolic syndrome in part through these underlying metabolic disturbances. To our knowledge, only one study has reported that CRP concentrations predict the development of the metabolic syndrome . In this study the association was present in Mexican women, but not in men. The discrepancy may be due to ethnic differences or the use of an arbitrary definition of the metabolic syndrome that differed substantially from the definitions devised by the NCEP and the WHO. In vitro and small human studies have suggested several mechanisms by which low-grade inflammation may increase insulin resistance, dyslipidaemia, and endothelial dysfunction [1, 2, 3, 4, 5, 15, 16, 17]. Markers of inflammation, such as white blood cell count and fibrinogen, have been shown to predict weight gain, a key triggering factor of the metabolic syndrome, in a 3-year follow-up of the Atherosclerosis Risk in Communities cohort . Conversely, weight loss has been shown to decrease markers of inflammation in morbidly obese patients with features of the metabolic syndrome . CRP concentrations have also been observed to predict the development of hypertension . In analyses using polynomial logistic regression with metabolic outcome as the dependent variable, CRP levels in men who later developed diabetes and the metabolic syndrome according to both definitions were dramatically shifted from <1 mg/l at baseline to ≥3 mg/l compared with men who developed none of the metabolic endpoints. CRP levels were more strongly associated with incident diabetes during follow-up than with the metabolic syndrome, at least as defined by the NCEP. Men with neither the metabolic syndrome nor diabetes at baseline who developed diabetes during follow-up had higher fasting glucose levels at baseline and follow-up and higher triglyceride levels at follow-up. Otherwise they did not differ with respect to other features of insulin resistance from men who developed the metabolic syndrome, but not diabetes (data not shown). This may imply that inflammation disturbs pancreatic beta cell function in those who are genetically susceptible. However, findings from the Insulin Resistance in Atherosclerosis Study suggest that low-grade inflammation contributes to insulin resistance, but not to impaired insulin secretion . Inflammation could also promote hepatic insulin resistance to a greater extent in those who are genetically susceptible to diabetes, as hepatic insulin resistance exacerbates fasting glycaemia and hypertriglyceridaemia . Inflammation may be more strongly associated with the WHO definition of the metabolic syndrome than the NCEP definition because the former includes a measure of insulin resistance. Overall, our findings provide corroborating evidence that CRP [10, 11, 12, 13, 14, 18] and pro-inflammatory cytokines [10, 19] predict Type 2 diabetes in diverse populations with varying risk factors. Adjustment for BMI or other factors related to insulin resistance markedly attenuated these associations with diabetes, but an independent predictive value was retained in some studies [10, 12, 20]. Trials that specifically focus on decreasing inflammation with diabetes or cardiovascular disease as an endpoint are still lacking. In a small study, high-dose aspirin has been shown to improve glucose tolerance and insulin sensitivity in patients with Type 2 diabetes , presumably by inhibiting the serine kinase, IKKβ . Thiazolidinediones may improve insulin sensitivity by decreasing inflammation, in addition to their many other metabolic effects . In a retrospective analysis, aspirin was most effective in the primary prevention of myocardial infarction in men with high CRP levels who participated in the Physicians Health Study . Statins, ACE inhibitors and several other pharmaceutical agents also have anti-inflammatory properties that may contribute to their cardiovascular and metabolic effects [2, 4, 38]. Lifestyle changes are the first-line treatment in the prevention of diabetes [38, 39, 40]. Weight loss  and weight loss combined with physical activity and dietary changes [41, 42] have been shown to decrease markers of inflammation in obese individuals, including those with features of the metabolic syndrome . Cross-sectionally high n-3 fatty acid intake  and a low glycaemic index  have been associated with low levels of inflammation. Physical activity  and cardiorespiratory fitness [44, 45] are also inversely related to CRP concentrations and other markers of inflammation. Interestingly, abstension from smoking may not reverse the elevated inflammation that occurs with chronic smoking . The strengths of this study include its large, population-based design and detailed assessment of features related to insulin resistance. We used only CRP as a marker of inflammation, with cut-off values as recommended by the Centers for Disease Control and the American Heart Association . Studies have consistently identified CRP as a cardiovascular risk marker, and CRP has a long half-life and shows little diurnal variation [2, 6]. Moreover, of the markers of inflammation, only CRP has been recommended as an adjunct for risk stratification in the prevention of cardiovascular disease . Low-grade inflammation increases the risk of the metabolic syndrome and diabetes in middle-aged men, but some of the risk is mediated through obesity and factors related to insulin resistance. Our findings support the hypothesis that chronic inflammation is a common antecedent for the metabolic syndrome and its consequences, diabetes and cardiovascular disease. The KIHD was supported by grants from the Academy of Finland (grant numbers 41471, 1041086, 2041022 and 45155) and the Ministry of Education of Finland (grant numbers 167/722/96, 157/722/97 and 156/722/98) to J. T. Salonen and from the National Heart, Lung and Blood Institute of the USA (grant number HL44199) to G. A. Kaplan. We thank the staff at the Research Institute of Public Health, the University of Kuopio and the Kuopio Research Institute of Exercise Medicine for data collection in the KIHD.